Good rugby passing is a key part of your game. Use these different passes so you are confident you have great skills and you pass the ball well in play. If you want to pass well, first make sure you handle well. Any doubts? You have sound foundations for your passing if you first have a look at handling. Then you`ll easily get to grips with the basics. Why know different rugby passes? There are many different types of pass. If you have ever had to do something using tools, you know it`s important to "have the right tool for the job". There`s also a saying something like, "if you have only a hammer everything looks like a nail". But of course not everything is a nail. You need more than a hammer. See some passes in games of rugby. In the same way, many passes do not need to travel 20-30metres. You need more than a bullet-like spiral pass. Firing out a superbly spinning spiral pass that could travel 20 metres, when a gentle lob is needed, is likely to cause problems! Make sure you have a range of passes in your passing toolbox. It`s well worth knowing as many passes as possible. They are all suitable in certain circumstances, some in a range of situations and it`s worth having the right pass for the job. 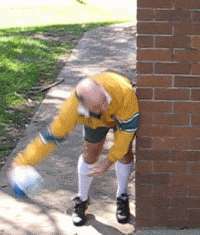 People new to rugby often refer to how to pass as how to "throw" a rugby ball. Consider these when you want to learn how to pass. One of the main-stays of rugby passing. A pass used very frequently. However it is tending to be replaced by longer passes. You make this pass with two hands moving across in front of your body. Most useful for passes of a few metres. This is a very versatile pass can be used in many situations and you can easily control the speed and distance of the pass. Find out more about how and why you use this basic pass. 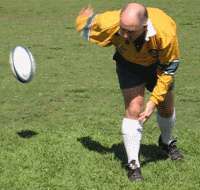 Another of the major skills in passing in rugby. Used very frequently especially in top class rugby. You make this pass with two hands moving across in front of your body. It differs from the normal pass in that you apply spin to the ball as you make the pass. These passes tend to be fast and hard, spinning swiftly to the receiver. Most useful for passes of many metres especially along the back-line. for long passes to distant support players to swiftly change the point of attack. Find out all about this long, spinning pass. More specialised area of passing. This pass is used most often when you are the scrum-half or the player acting in that role. You remove the ball from the base of the scrum or a ruck and send it out to the backs. If you position your feet and arms well in relation to the ball, you pass swiftly, you give the receiver more time and space. Find out more about how and why you use this scrumhalf pass. Another from the old days of rugby. Pick up, dive and fling. This pass still has a place in the game. When unable to position your body to make a good ground pass this is a useful substitute pass. You make the pass with two hands whilst performing a diving motion towards your target. You swing your arms out from under your body, flinging the ball towards the receiver. Find out more about how and why you make this older style pass. This is an older pass, not seen very often. It`s a very convincing pass "for selling the dummy" (see dummy pass). A very useful pass but one more likely to be seen in old rugby player autobiographies. 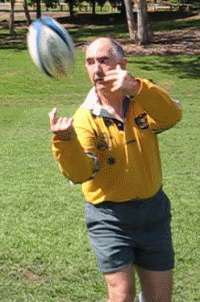 The pass was used before the spin pass became fashionable for longer passes. You use both hands moving across in front of your body. At the same time you "sink" your hips giving the ball extra momentum for longer passes. Find out more about how and why you make a pass like this. 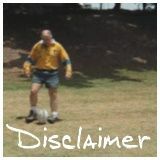 Use it for short passes to players in close support. Move your arms to disguise what you are doing, but supply power mainly with your fingers, giving great control over short distances. You pop the ball into (or up and into) the path of a support player running fast and close to take advantage of a gap in the defence. Use this when you are highly skilled in handling and passing. Find out more about how, why and when you make this short pass. Rarely used. Fun to practice and believe you will be good enough to use it one day. Effective, for experts only! Avoid using it in a game unless you are expert or desperate. Make that expert AND desperate! Useful when a long ground pass is required but you are not in the correct position to make one and pressure prevents you from taking time to get set. A risky pass. Should only be attempted by the highly skilled in dire emergencies! Look to players like Gareth Edwards for examples of this type of skill. Find out more about this rarely used pass. You use this pass to keep the ball alive, moving the ball to a close support player. You will mainly use this pass while fending off would-be tacklers with the other arm. You use a flicking motion with your hand moving the ball sideways or backwards. Find out more about how you make this clever pass. You keep the ball alive when you are being tackled. Then use one hand to pass the ball round the back of the tackler to your support player coming through on the burst. Now, just say you have been tackled by a brick toilet block. This is how you pass round the corner! Find out more about how to make this difficult but devastating pass. A one or two handed pass. You use this pass to get the ball to a supporting player when there is an opposition player directly between you and your support. The lobbing motion allows the ball to travel in an arc above and out of reach of your opponent(s). Here is how you put one over them (one and two handed). Used to get the ball to a close support player. Really a normal pass is required but may not be possible, so a lob is used instead, often back over your shoulder. How you make this devious pass. Clever, tricky manouevre as much as simply passing. You do this to switch direction, often to avoid going "into touch" (to avoid stepping on or over the touch line). You usually use two hands for the scissors pass but it is possible with one. You use it to switch the point of attack by combining with a support player. Instead of continuing to run outside you and receiving a normal pass your support sharply changes direction and cuts across close behind you. As they do this, you swivel and pass the ball to them, either before they disappear easiest and best) or as they re-appear from behind you. Disguise what you are doing as much as possible. The pass that`s not a pass. You do it well and they don`t bother to tackle you! It just looks like a pass. It is part of your evasion toolkit. 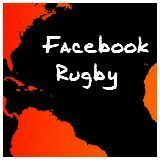 You use it like the sidestep to play with opposition minds, conceal what is really happening on the field. Many of the above passes can be turned into this type of pass. All you have to do is convince the opposition you are going to pass then not actually complete the pass. You hang on to the ball	and use the situation to your advantage. When you perform well your opponent believes you have passed the ball and there is no reason to tackle you. Instead they choose to follow the ball and get the receiver of the pass. They leave a gap in the defence and you slip through. Find out more about how and why you confuse them with this pass. A very useful, advanced pass, part of good deception in the game. Instead of passing to the player running next to you, you throw the pass harder and longer so it cuts out that player and is caught by the next-but-one player. Positioning of opposition players determines when it`s a good option. The best situation for this pass is when the opposition is stretched in defence and one of their players has to cover more than one player outside you. If you see that the the opponent is committing to the team-mate nearest you, wait til they are committed and fire the cut-out, setting your outside player free. Often the cut-out is made too soon, giving the lone opposition player time to slide out and tackle the player who receives the ball. Perfect timing is essential for this pass to be effective. You can gain an understanding of some of these passes with our game. You control 3 players by telling them what type of pass to use and when. The better your pass selection and timing, the more tries for your team. Just like the real thing, eh! Try and score in the passing game.